A young Indian businessman who wanted to get back on his girlfriend’s good side after an argument put up 300 billboards and signs all over their local suburb, to let her know he wanted her forgiveness. It’s not clear what 25-year-old Nilesh Khedekar had done to upset his girlfriend, but he clearly thought it serious enough to be worth the effort of an impressive operation to earn her forgiveness. 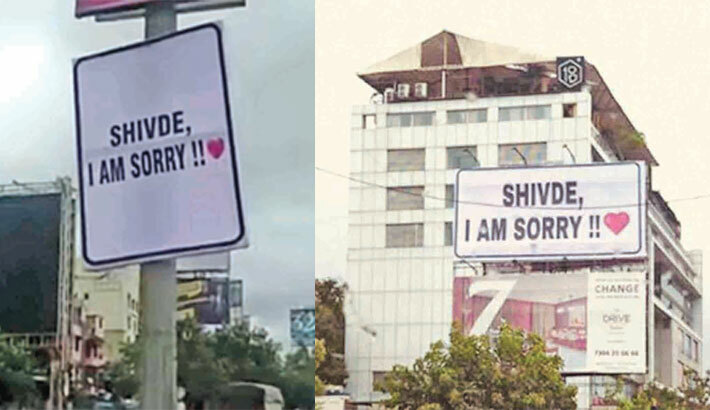 Last week, after hearing that the girl, named Shivde, was returning from Mumbai to her home in Pimple Saudagar, a suburb of Pune, the young man decided he had to come up with a creative way of showing her just how sorry he was about their argument. He got in touch with a printer and commissioned hundreds of different-sized posters with the message “Shivde, I am Sorry!”. Then, on the night before the girl’s scheduled returned, he paid a group of boys to hang the signs and billboards all over her neighborhood. On Friday morning, the people of Pimple Saudagar woke up to 300 posters and signs on buildings, lamp posts and billboards, all carrying the same mysterious message and a heart sign. People started taking photos of the signs and posting them on social media, and by midday, they had become the talk of the town. While most people online thought it was romantic how someone had gone to all this trouble to apologise to their loved one, the local police weren’t so impressed. By Friday evening, authorities had already tracked down the printer, the boys who had put up the posters and eventually the man who had orchestrated the whole thing, Nilesh Khedekar. He told police about the argument he had had with Shivde, and how he tried to do something creative to earn her forgiveness, like putting up hundreds of posters on the route she would return on from Mumbai. “Khedekar told that he had some differences with his girlfriend whom he called ‘Shivde’. In order to apologise to her he came up with this idea of putting up hoardings and banners in the area where she stays. Khedekar roped in his friend to execute the plan,” a police officer told DNA India. Unfortunately for the 25-year-old director of a family-owned company, his plan didn’t work out quite the way he wanted. After spending a reported RS72,000 ($1,000) to have the posters printed and put up around town, all he had to show for it was a formal complaint from Pimpri-Chinchwad Municipal Corporation (PCMC) officials, for defacing the locality. It’s unclear what the penalty is in such cases, but it most likely involves a fine. “The entire thing has turned ugly. My idea was to be creative in apologising to her. Now I think I shouldn’t have done it in the first place. I have let my parents down. I have let her (girlfriend) and her family down as well,” Nilesh said. While his 300 hundred posters have since been taken down, they are still circulating on social media sites like Twitter and Facebook. No word on whether Shivde has actually forgiven the hero of our story. Is BNP Really a Political Party?